We have mobile services! We can come to you! The most common vehicles we work with here at Advanced Auto Glass is a car or truck, but we also service SUVs, work vehicles, and motorcycles. If you are in need of any auto glass repair, Advanced Auto Glass in the Dallas and Fort Worth, Texas area has you covered. Our technicians are trained to both replace and repair any kind of glass for a vehicle and are happy to present you with a quote and traveling service to make your experience with us as smooth and painless as possible. Before you call around, check out the premier auto glass replacement company in the Dallas Fort Worth area and see how we can help you get the repair you need today. Auto glass replacement can be a simple process when done right. That is why it is important to hire a trusted auto glass company to handle all windshield repairs so that the damage is not made worse. Advanced Auto Glass has a strict process that our technicians stick to in order to get the job done right the first time. Auto glass replacement or repair can be done anywhere as long as the correct care is taken. It is important to call us as soon as possible because the smaller the crack in your glass, the easier the process will be. Cracks and chips must also be clean in order to then repair them. The process will only take longer if our technician must clean the windshield thoroughly. After the cleaning is done, we can measure the damage with our tools to be certain a repair can be made. We look at several factors such as the location and size of the crack or ding in your windshield. Once we know it can be repaired, we get to work immediately. The process of repair is a quick one, and we know just how to do it correctly so that we do not waste your procession time or money. Once the repair has been made, the auto glass must set in the sun for a period of time. Then, you can drive your vehicle again. It will be as good as new! One of the biggest concerns about auto glass replacement for our customers is whether or not their insurance will cover the repairs. Auto glass repair is crucial to your safety when you have a nick or crack in your windshield. To make the process as painless and swift as possible, we do assist you in working with your insurance company to get this service covered. Our team will fill out all the necessary insurance claim paperwork to send to your auto insurance company. There is no need to do all the heavy lifting in this case. If you have full coverage on your vehicle, auto glass repair is almost always covered to some extent, and many cover it up to 100 percent. If you give us a call, one of our friendly customer service representatives would be happy to discuss your auto insurance with you to determine your coverage amount. We love helping out customers in this way because we know every penny counts. If you do not have coverage for windshield replacement or auto glass repair, we can still help! Our friendly and helpful customer service reps will give you an affordable quote to make sure you can still have your windshield repaired. When you need auto glass repair, you need help from an expert. Advanced Auto Glass is ready to help you, all you have to do is call. Contact us at 817-589-7702 today! Paige set my apt up very quickly. Love the mobile service. Danny was very respectful and got the job done pretty quick. Thank you all. Great customer service and they got me in and out in a timely manner!! Paige was very responsive to helping me have my windshield repaired, and they come out very quickly to perform the work. Great service and friendly folks! Excellent customer service, very pleased and would highly recommend! Advanced Auto has been so wonderful to work with. Audrey has done everything she can do to make it easy for us. I cannot say enough about all they did for us to make the replacement of our windshield and the calibration be so easy. Thank you for going out of your way and working with our Honda dealer! Happy with the job they did. True to their word. Reliable. Thanks to all at Advanced Auto Glass for the professional installation and later repair of my windshield. Britt did a great job on both visits. I will recommend your company in future referrals as the office and field personnel are top notch in courtesy and craftsmanship. Noe was the technician on the property and he was so friendly and professional. He was timely and did a perfect job on my apartment window. I would recommend them to anyone! Onsite replaced the front windshield of our insurance clients Honda. Thanks again!! Onsite replaced the front windshield of our insurance clients Dodge 2500. Thanks again!! Brad went mobile to customer and replaced the windshield on customer's 2014 Jeep Wrangler. Danny went mobile to replace customer's door glass in her Nissan Rogue. WE ONSITE REPLACED THE OEM WINDSHIELD OF OUR INSURANCE CLIENTS JEEP WRANGLER. THANKS SO MUCH!! REPLACED ONSITE THE BACK GLASS ON OUR CUSTOMERS DODGE NITRO. THANK YOU!! REPLACED ONSITE THE FRONT WINDSHIELD OF OUR INSURANCE CLIENTS FORD SEDAN. THANK YOU!! DANNY REPLACED THE FRONT WINDSHIELD ON OUR CUSTOMERS BEAUTIFUL VEHICLE, EQUIPPED WITH RAIN SENSOR, LANE DEPARTURE, HEADS UP DISPLAY AND MORE. REPLACED THE WINDSHIELD ON OUR CUSTOMERS FORD TRANSIT SERVICE VAN. THANK YOU! CUSTOMER HAD HER WINDSHIELD REPLACED ON HER CADILLAC SRX!! REPLACED CUSTOMER'S WINDSHIELD ON HER CADILLAC SRX! 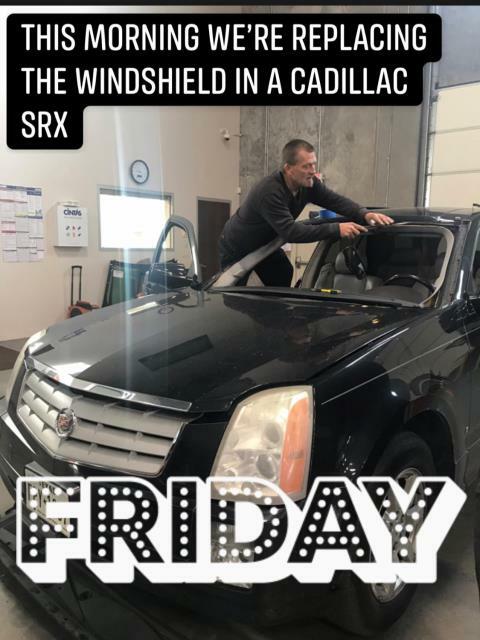 Dispatched Brad same day to repair customer's windshield damaged by rock chips. REPLACED OEM WINDSHIELD & RE-CALIBRATED SENSORS ON OUR CUSTOMERS 2018 HONDA CR-V.
Noe replaced glass and vinyl beading in residential window. Noe replace glass & vinyl beading in residential window. Customer got a new windshield and a re-calibration done on her windshield in a timely manner!! customer came in shop for a windshield replacement on his jeep!!! Dispatching Noe to go out to replace window glass and vinyl beading in customer's residential window. Writing up work order for a framed shower enclosure. Britt went to customer's work place to replace the windshield in her 2013 BMW 328. Tommy went mobile and replaced the windshield in customer's 2014 GMC K1500 truck. Britt went mobile to repair a chip on Mr. Romano's windshield. Britt went mobile to customer's residence and replaced the windshield on his 2002 Toyota 4 Runner. Noe and Devon went out to customer's residence and completed three whole window replacements in his home. Britt went mobile to customer's work to replace the windshield on her 2016 Toyota Rav 4. Britt went mobile to customer's residence to replace the windshield on her 2012 Honda Odyssey. Brad went mobile to customer's job to replace the windshield on his 2013 Land Rover Range Rover Sport. Brad went mobile to customer's job to replace the windshield on his 2013 Chevrolet Equinox.